Note: This article contains graphic images that some readers may find disturbing. Doctors first began posting the photos last week, shortly after the NRA criticized the medical community for pushing for legislative solutions to gun violence—suggesting that physicians are somehow less qualified than a lobbying organization to comment on a public health crisis that sent 700,000 Americans to emergency rooms over the course of a decade. 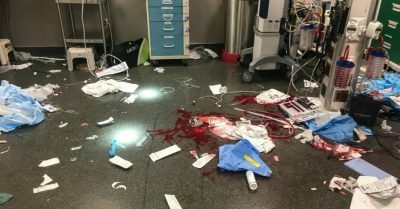 Using the hashtag #ThisIsOurLane, doctors from all over the country posted photos of bloody hospital scrubs and operating rooms, showing the gruesome consequences of the NRA’s refusal to back even broadly popular gun control reforms like universal background checks. Doctors also signed a letter condemning the NRA’s tweet and imploring the group to either step aside or join them in fighting the gun violence epidemic. The photos and letter were posted in support of Dr. Judy Melinek, whose response to the NRA’s tweet last week went viral. While the photos are disturbing to look at, some gun control advocates have argued that showing the horrific reality of the 67,000 gunshot wounds, 32,000 gun deaths that happen annually in the U.S. is a necessary step toward enacting far-reaching reforms. Filmmaker and activist Michael Moore predicted that if photos of the crime scene at Sandy Hook Elementary School, where 26 people including 20 first-graders were killed in a mass shooting in 2012, had been leaked to the public, Americans would no longer tolerate the NRA’s control over lawmakers who fail to take action to curb gun violence. “As a country, we lost our teachable moment” when Americans moved on after mourning Sandy Hook from a distance.